A waterfall in your own backyard sounds like a great feature, and with it flowing into a pretty pond we are starting to get a really nice landscaping picture. But can you actually build a pond and a waterfall ? Well yes you can and we give you a few ideas. 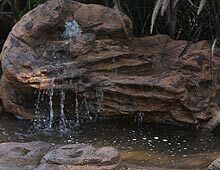 Waterfalls	and fish safe areas can be added to your DIY backyard pond if you wish to go a step further. Building a backyard pond and adding a waterfall can make great water feature that adds a sense of tranquility and peace to your home. 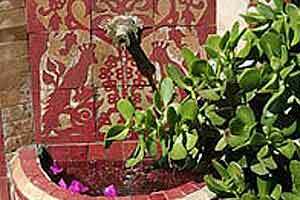 Small ponds can also be built on patios or even indoors, pond kits with pumps are readily available. 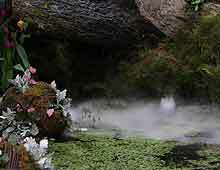 We provide some ideas on how to build a backyard pond including waterfall or fish pond. With literally thousands of backyard ponds being built every month its easy to understand the attraction, its not only the aesthetic value but also the feeling if peace and tranquility that gently running water can add to any environment. 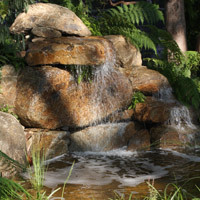 We provide some basic ideas on how to build a pond and waterfall in your own backyard. A cross section diagram of a pond plan shows the placement of shelves in relationship to the ponds itself. lining material such as packing sand or a substitute. The first step is to choose a position for the pond. Ponds require a mixture of light and shade. A relatively flat position is best as this will require less digging and structural work. Consider proximity to power for the pond pump. Consult local authorities to ensure that you comply with any regulations or pond design requirements as well as useful advice on how to build your pond..
Mark out your proposed backyard pond outline with a string line. Its best to have an outline of what the completed project will look like before you start. Level the area outside the string line for 2ft or more. The edge of pond needs to be level, so if you create a level edge to work from it makes digging more efficient. Commence digging the pond. Ponds need to be at least 2ft deep so that the water remains cool enough for fish and water plants. A cool pond also helps prevent Blanket Weed Consider plant platforms as you dig, refer to the diagram provided below. Remove any rocks or tree roots from the completed hole. Line the hole with washed packing sand or or other soft material so that the pond liner will not suffer any damage. Put in place your pond pump following directions from individual manufacturer. Fill the pond with water, ensuring that the liner is flat and is not pulled back into the pool. Place edging materials around your backyard pond and complete landscaping. 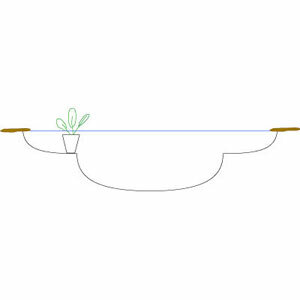 Install plants on plant shelves. Turn on the pump sit back and admire you new pond. We recommend running the pond pump for 3-4 days before introducing fish, this gives the water a chance to stabilize in temperature and for any impurities to settle. Install the pond liner ensuring that it reaches up and over the edge of the pool. 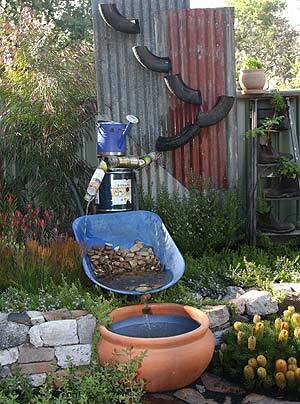 Or consider building your own waterfall from recycled materials, all you need is the imagination and a few basic building skill. It is certainly the cheapest way to build a waterfall.